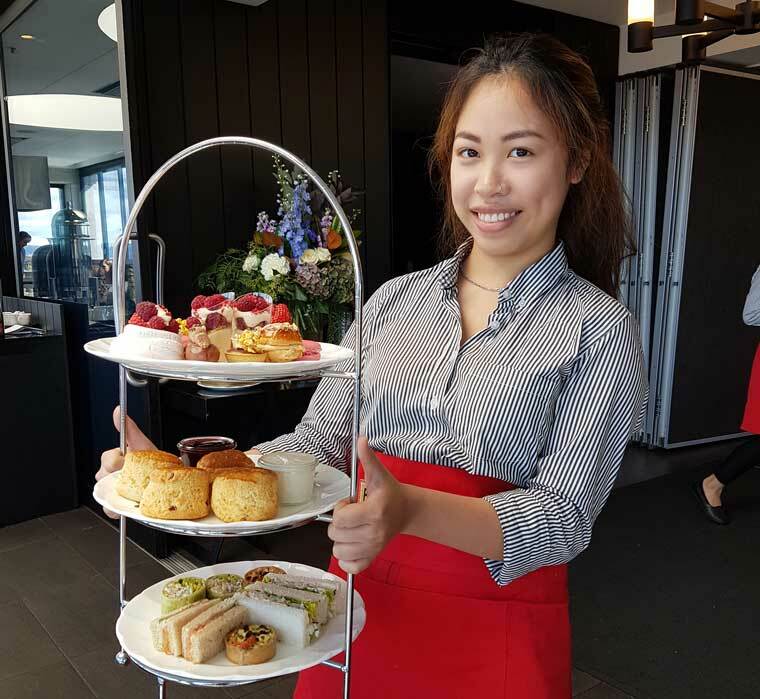 Served on the topmost level of Canberra's Burbury Hotel, high tea on the terrace offers a stunning perspective of the leafy Barton district and surrounding areas, with views of Parliament House, Black Mountain and the Telstra Tower. 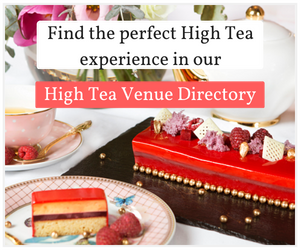 Looking for high tea with a view? 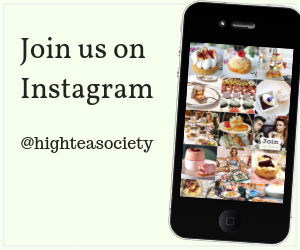 The terrace’s floor to ceiling windows are clearly a main attraction, with the venue close to full when the High Tea Society arrives, only half an hour after service has begun for the afternoon. The atmosphere is lively and chatty, and there are even a few men among the clientele for the day. We are each offered a glass of Piper-Heidsieck champagne on arrival and are referred to the menu to select from one of six TWG teas on offer (there’s also coffee if you prefer a caffeine hit). The table is set with white Maxwell and Williams Cashmere “Charming” tea ware, a silver tea strainer and white and brown sugar cubes with mini silver tongs. Tea is served in individual teapots. 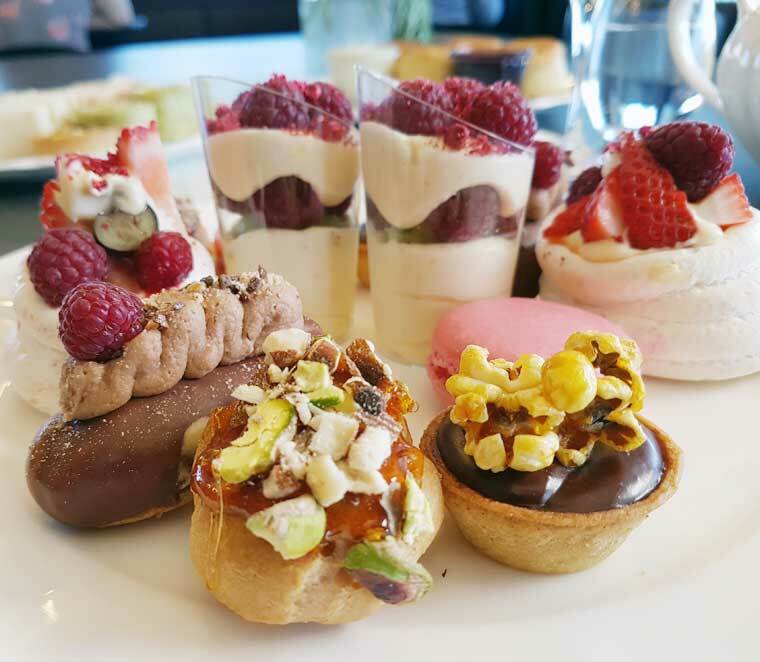 The high tea menu is served on a traditional three-tier cake stand, with savoury items on the bottom, scones on the middle tier, and an impressive selection of petit fours up top. Executive chef Fabien Wagnon said the menu, which draws in about 120 people each weekend, changes seasonally. “It’s a bit of a mix between a traditional English high tea menu and a French version,” Mr Wagnon said. This menu merges two traditional sandwich fillings – salmon and cucumber – into one, adding lime mayonnaise and a barely discernable hit of wasabi for that added kick. A generously-filled prawn sandwich was a delicious departure from tradition, and the chicken waldorf wrap also had a liberal filling. Then there’s a selection of buttermilk and cranberry and orange zest scones, served alongside glass pots of jam and cream. But the French influence really shines through with the desserts. Berries – especially raspberries – feature prominently throughout the dessert offering. Most notably, raspberries were layered among a white chocolate mousse, much like a trifle, with a surprise pistachio crumb in the middle. The salted-caramel-filled profiterole with toffee and pistachios on top was the highlight of the desserts, and the rich dark chocolate filling in the chocolate and walnut tarte is sure to tempt any chocolate lover. 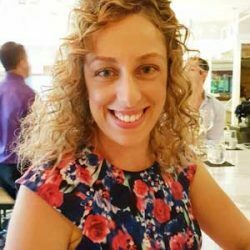 For those passing through Canberra for a night (or two, or a few! ), it’s also worth considering the Burbury Hotel for your stay. Boasting a monochromatic decor with timber and metal details, the High Tea Society enjoyed a night in the Burbury suite, which included a bedroom with king-sized bed, bathroom, separate living and dining area, kitchen with Nespresso coffee machine, a European laundry and a private balcony. The room was tidy and service was polite and accommodating without being intrusive. The hotel, which is located within the “Realm precinct”, also includes the Hotel Realm (both hotels are owned by the Doma Hotels group), a number of restaurants and cafes, and is within walking distance of Parliament House and Lake Burley Griffin. There’s free underground parking on weekends, or $15 on weekdays, and free wifi for hotel guests. 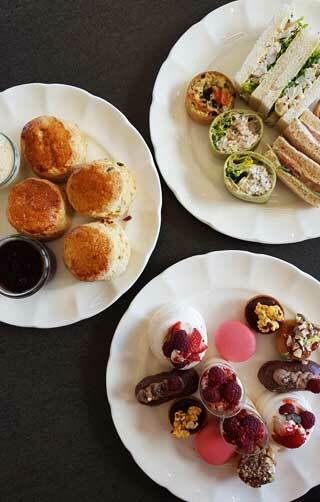 A gluten free high tea menu is available.